Felicia Johnson, VR Commissioner, gives opening remarks at the Central Re-entry Job Fair. Four Re-entry Job Fairs are held in South Carolina each year. The Greater Upstate Re-Entry Job Fair and Pee Dee Re-Entry Job Fair are held in the spring in Greenville and Florence respectively. 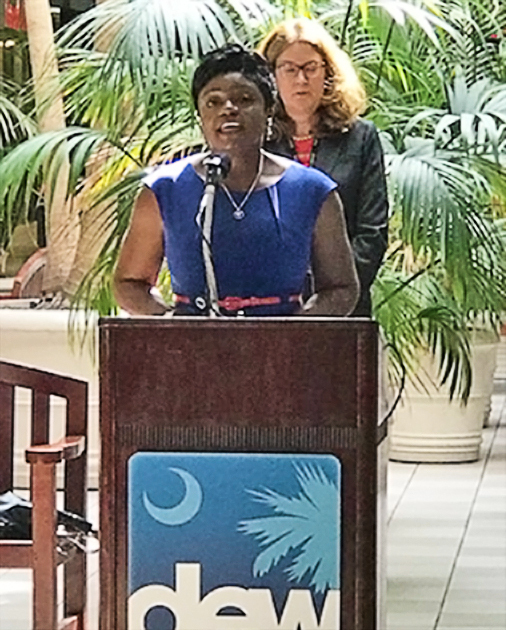 The Re-entry Job Fairs are a collaboration between employers, agencies, not-for-profits, technical colleges and vendors that provide information and resources to South Carolinians with a criminal background who are seeking employment. Partners include the United States Attorney’s Office; the South Carolina Department of Probation, Parole and Pardon Services; SC Works; SC Vocational Rehabilitation; SC Department of Social Services; and the US Probation Office.